This month's Blog Carnival is being shepherded by enderra.com here and the topic is "A New Year, A New World." Folks can keep track of each new month and visit the archives for the Blog Carnival on roleplayingtips.com here. In my regular RPG campaign, the players, through their characters, have been exploring the Trackless Moors, an expanse of wilderness that bisects a major kingdom named Jals in the far southeast of a large, established empire. It's the frontier as it is but this wilderness has always been problematic and too wild to tame in any economically feasible sense for the ruling family in the area. The players have had at this kingdom, its political seat of power, Jalston, and much of the northern end of the Trackless Moors for months as part of their exploration. However, aside from some minor subterranean forays into tombs and basements, they had yet to explore anything resembling an underworld until just this month. Now they are in an extensive series of caverns that are only a fraction of the vastness of Tartarus. For them, this is a whole new world beneath the world in which they were beginning to become comfortable. 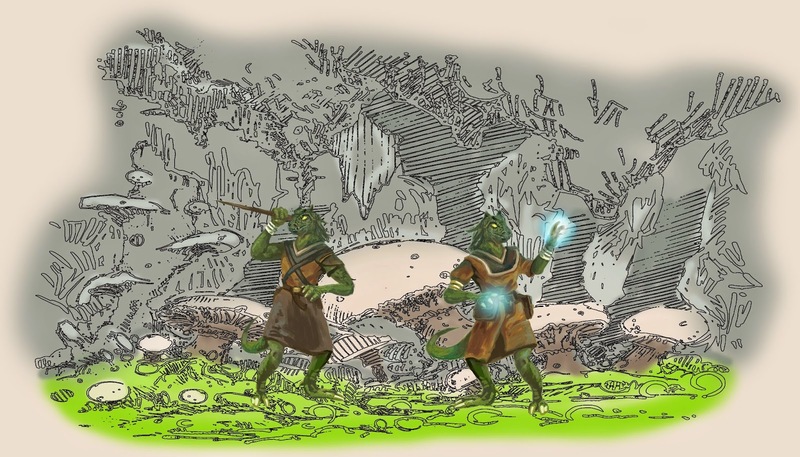 with two overlayed lizardfolk images by Jeff Ward. Keep in mind, my own campaign world has been around for 40 years. I started RPGing when D&D first came on the scene in 1974 and added it to the rotation of wargames and minis wargames I had been playing with my friends. Our first GM (we played more than just D&D) had dibs on the TSR, Judges Guild, and other professional products to seed his own campaign world, including any magazine offerings, so it really left me having to work up a setting whole cloth. Of course, I follow the advice in the booklets, starting with a town and local "dungeon" with progressively more difficult levels to explore. It wasn't long, though, before I determined that for the underworld to make sense it needed to have many far-flung points of entry: mines dug too deep (thanks, Tolkien! ), cave ins down into caverns, chutes discovered while building tombs, etc. Over four decades, this has grown and grown even as had the surface world of the Grymvald setting. So, now this group of players, aged from mid-twenties to mid-fifties, are delving into areas where no other players have gone but which were always there. They explored some areas of a series of towers on the Trackless Moors known as the Dragon's Teeth, some of which have been lightly explored in campaigns past, but what they found beneath is for them, and in some ways for me, a whole new world.